I accosted Wissam Al Mana. It's true. I'd been following the youngest Al Mana brother's movements for years, so when I finally had the chance to approach him for an interview, I wasn't going to let it slip through my fingers. I wanted to know more about this hybrid Qatari who gives off dueling energies of a hands-on businessman attending his own events --less in a ribbon-cutting capacity and more in a hands-on ownership type of scenario- and a harangued privacy-seeking international figure of interest. While I understand that his public appearances could fall under the do-what-you-gotta-do scenario, I wanted to hear Al Mana tell me for himself- about his work, his life, and yes, about the sensations of both privacy and unorthodoxy in whatever (serious) press coverage there is about him. Why am I referring to him as a hybrid? Because later I find out that he's got a slight pan-Euro accent with a touch of British inflection, and an East meets West mentality that permeates everything from his business decisions to his conversational demeanor. 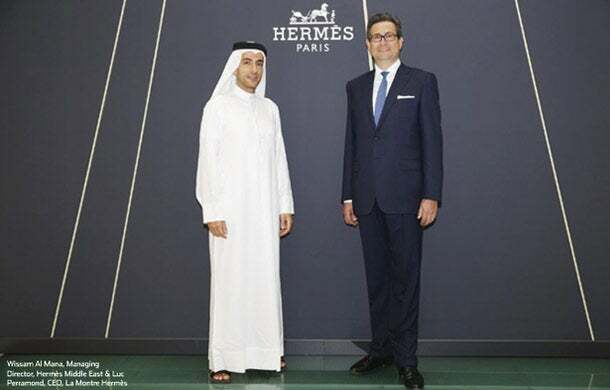 I wait for an opportune time at the private kickoff of the La Montre Hermés "Of Mastery and Time" instillation at the Dubai Mall, and I make my not-so-subtle move: "Mr. Al Mana, I want you to be on my cover." Notoriously private, I expect him to flat out refuse. "Your cover? Really?" The charismatic Qatari businessman, smiling down at me from his six ft. plus height, for some reason decides that I'm not overly crass for cornering him at an event (a bit of a media no-no), and takes me seriously enough that he agrees to a private sit down on-record later in the week. "You can ask me anything you want; I'm very opinionated... except about my private life. I don't want to talk about that." But talk about that he does, that and so much more... Like how it feels to be in a PR catastrophe: "People want to take advantage of you, because all of a sudden you're famous, and you're in the headlines and it's easy to get that attention." And why he challenges himself perpetually: "It's about being able to manage and to be skilled at operating different types of businesses. I have to, I get bored if I don't." I've fast forwarded to a few days later, and at this point I'm seated with Al Mana in a well-lit room at the Ritz-Carlton Dubai, and he's much more frank than I expect. Reclining comfortably in national dress, Al Mana is pleasant, well- spoken and polished, and initially I have a difficult time gearing up to grill him as it seems like a violation of the quiet waves of sincerity that he emits. "I don't have Facebook, I don't have Twitter. I don't have anything, because believe it or not I'm a very, very private person! I don't even have WhatsApp! I don't like to pry into people's business." Wissam Al Mana had more than his fair share of press... and not all of it is flattering nor is it cohesive. To begin with, his official work position with the Al Mana family group of companies is confusingly reported in many different ways -- when I meet him, it's in his capacity as the Managing Director of Hermés Middle East, one of the brands encompassed in the mammoth and diverse family portfolio that includes everything from automotives to F&B. "My late father was the agent for Nissan, he was one of the first to bring vehicles to the region. Our relationship with Nissan and Renault is one of [our] major revenue-streams until today." Still in the context of revenue streams, Al Mana says that their biggest boons are "probably broken up between distribution, real estate, retail, and within the retail division it's very diversified. I want to sell everything, I'd even open up a candy store," he says smiling. It's apparent that family matters to Wissam- he mentions his late father, Saleh Al Hamad Al Mana, several times during the course of the interview, and talks often about his older brothers Hisham and Kamal. "Between my brothers and I there is a structure. We basically handle different responsibilities and different companies within the group. We all enjoy doing different things, we all like to put our hands in certain industries and activities. There's no rule that I can't do this because my brother is. I do most of the business development. We're becoming very selective in our approach; we try to work with the best brands in each segment, as opposed to the most brands. We've tried the 'most brands' way, and it doesn't work because you end up in these situation where 20% of your brands make up 80% of your profits, the 80-20 rule." Within this framework, being a family-oriented conglomerate seems to be a strength of theirs, with a division of labor that Al Mana says works very well for them. "The way we operate as a group, the management is very horizontal, it's very flat. We don't have this typical hierarchical pyramid where you've got all these CEOs and vice presidents and everyone's reporting. It doesn't really work. We try to take companies and work with them individually because we feel that every company has specific needs and we are fortunate to be young enough to take a much more active role in our operations, and in our company structure." One of the topics that elicits the most effusive response from Al Mana is how and why he joined the family biz. "I always wanted to. My father passed away when I was quite young, and I felt that it was my duty to kind of pick up the flag and to continue the business, and try to continue the legacy and the family name. It's in our blood, we're merchants. When I was a child, I looked at my father's passport and his occupation said 'Merchant'. I asked my mom, and she explained that we are merchants. We take pride in that, it's our heritage." These merchants seem to believe in plotting their way forward, and they're now setting their sights on a slice of the highly sought-after KSA-pie in two of the family's current expertise arenas: Luxury retail and niche sporting goods. "I'm travelling to Saudi Arabia for a few days. We're planning on entering the Saudi market in 2015, so we're laying the foundations for that. It's a huge market and we understand that there's great potential there. We've been very cautious about how to enter the market because we know of other groups who've entered and failed. There's a certain culture in Saudi Arabia that is somewhat different from the rest of the GCC, and that has to be respected." Respect is something that Al Mana has for a few different ideas that we touch on, namely his cultural heritage and religion. This comes into play at different business-context junctures, primarily in the F&B sphere and the decision to only team up with brands who are willing to adopt Muslim religious mores- and that means eschewing products involving alcohol and pork. While F&B is not a large part of the Al Mana portfolio, their business is growing in that direction. 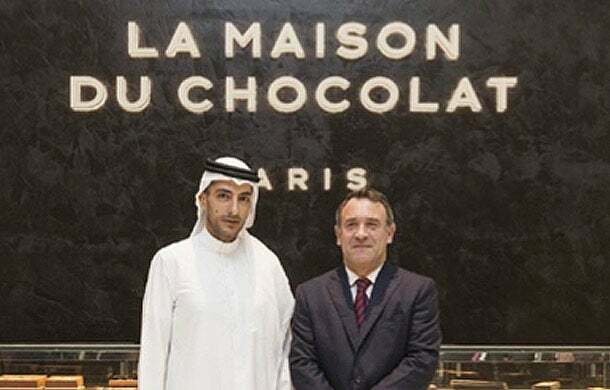 The family launched the Golden Arches of McDonalds in Qatar in the late 90's, and now have newer upscale hospitality pursuits like La Maison du Chocolat in Dubai Mall that opened November of last year, and he adds that they're currently in the process of launching their new premium food division. "One of the cultural restraints I'm finding is that we don't want to work or deal with alcohol for cultural and religious reasons. So it's trying to find the concepts that will work without actually serving it." Who opted to draw this line for the Al Mana umbrella holding? "It was my decision to be honest, I'm the one who is developing this division of the group. It was my choice not to venture into alcohol and pork because it's against my religion. It's really that simple- I thought it was the right decision to take. I think it's the easy way out to secure brands which serve alcohol, because alcohol makes up 30% to 40% of the profit." The group recently secured noted Italian gelato-purveyor Grom and eventually "decided to purchase shares in the mother company itself, because we feel that they have a lot of potential internationally and in wholesale and in other areas." And as for the brands who don't want to localize? "I've backed away from big deals because of this, and the culture that certain companies have. They don't want to embrace your culture, and I think they're setting themselves up for failure." Wissam is adamant that a "When in Rome" policy is needed for brands wanting to open up shop in the Middle East, and he brooks no excuses, faulting the companies for a lack of consumer insight and cultural awareness, giving examples of flawed visual presentations that flout MENA region cultural norms. "We work with a lot of fashion brands and every season they send us their advertising visuals, and the number of visuals that are rejected in the UAE is very similar to that of Qatar and Saudi. It's actually the brands' fault, and we tell them time and time again that we need visuals that conform to this part of the world and the culture here. I don't think they take it into consideration enough." His involved attitude doesn't end there, Al Mana wants to be part of every level of the business, and he's got a soft spot for a few of their endeavors in particular. "Yes money is important, the performance of the brand is important, but there are also brands that have meaning. If something is the best in its field, its nice to have." Hallmark brands are of interest to Al Mana, but so are businesses in need of an overhaul. "I recently purchased a very small company here in Dubai. They approached me and asked for help, offered a majority stake to manage and turn the business around. I'm in the process of restructuring. It's a nice challenge to take on these kinds of deals. It's a bit like playing a game where you've been playing it for many years, and you need to raise the level," he adds, likening it to a digital chess game, upping the ante and the level of difficulty. As for tech, Al Mana exudes enthusiasm here, detailing a rather complex plan that he hatched revolving around Apple. "I've always wanted our Group to get into technology as a personal passion, and it's a sign of the times. It's an area that we need to develop and be a part of. I approached Apple in the Middle East and I told them that I wanted to work with them. I wanted to throw my experience in retail behind it, and use my experience in APR -Apple Premium Reseller- stores. My goal eventually is to be the biggest APR retailer in the world. When I met with Apple, I told them and I put it in the presentation. They looked at me and they all smiled, and I'm like, 'But you know we just started...'" Al Mana laughs with me here as I goad him about such an ambitious statement, but then again why not? For the Al Mana family and their multitude of companies, such a grand declaration does seem feasible when taken in context, especially hearing Wissam detail the scope and breadth of the extended scheme. "After service support, work in B2B and B2C segments, we'll look at other parts of the sector. We're talking to various service providers who have business solutions as well." In this and other parts of their businesses, Qatar figures prominently, but Al Mana says that the family direction hasn't been affected by the 2022 FIFA World Cup win, despite its implications for business. "2022 allowed us to consider other opportunities in Qatar, and of course we're very happy about the World Cup, but I'm not sure it's really changed our strategy." His opinion of the melee surrounding the controversial sporting event? "Some countries are just bad losers, they're bad sports," he laughs. "I think certain countries were expecting to win, and we ended up winning. It's a great thing to allow small nations, who are developing at the rate that we're developing, this kind of opportunity. It should happen to other nations too, not just to us. Why should it be that only developed countries are the only ones who win these types of events?" he says rhetorically. I suggest that this is a textbook self-and-other case, in light of both the World Cup being granted to Qatar, and the UAE's recent Expo 2020 victory. Perhaps the rest of the world just doesn't want to see Arab countries land these types of global happenings? "I think there a lot of misconceptions about this part of the world, stemming from hatred toward Arabs and Muslims. I think that a lot of Westerners who come to this part of the world are pleasantly surprised. We're seeing more and more candidates from the West wanting to join our organization, wanting to work in Dubai, Abu Dhabi, Qatar. There are a lot of opportunities especially for entrepreneurs; they can benefit from the favorable factors like no taxes and so on." Al Mana and his brothers have all spent time in various Western countries, giving them an advantageous edge: They can see what others may miss in terms of globalization and East-West integrations. I find his carriage Western, but his orientation towards discretion decidedly more Eastern. He surprises me by bringing up his personal life, and the lack thereof when discussing paparazzi coverage and the internet. "That's primarily because I'm married to a very famous woman. What's happened since then? There's been an interest from the media to understand more about me and the fact that I'm from the Middle East. It's positive, it's negative, why? Because people want to be negative about you, it's like, 'Okay, let's pick on him today,'" he says gesturing, and I tend to agree after researching the existing articles written about him, even by regional media. I don't share my sentiments on this with Al Mana, doubtless he's aware of the somewhat cheap shots that the media has taken, but even business-staple Forbes debates his "billionaire status" and seems a tad gossipy when they mention him. Al Mana does talk about reputation management and sounds cynical regarding the wildfire media coverage by "some Jumeriah Jane" and her slanted take on the controversial sacking of two of his former staff: "It's irresponsible... Why didn't she pick up the phone and ask for my side of the story? The reality is that's very poor journalism." That, and his marriage to performing artist Janet Jackson is the subject of tabloids globally, mostly eclipsing any real articles about the youngest Al Mana's fervor for his life's work. "I spend time with my wife. It's a luxury. We love travelling... we love going to nice, exotic places far away from the world and from prying eyes. Over time, like anything in life, you find ways to master it and you learn how to do that." He has learned how to master many things if my hour- and-a-half long conversation is any indicator, including time management. "Time is like a very good friend who you don't see very often," he observes almost to himself. "There is this relationship: Time is the good friend that you're always chasing; time is luxury. Spending that couple of hours to do your own thing; I love looking at antiques, reading..."
Heavy is the head that wears the crown, and despite the lack of tact in using that particular example in a region filled with royalty, it's the best thing I can think of for this son of merchants who has managed to both transcend and transform the image of the modern Arab businessman, while still paying solemn homage to his family legacy. How does he feel about his family name actually being a brand? "I'm very proud. There's so many factors involved in being a good businessman- ethics, honesty. It's a huge responsibility. I spend a lot of time in the West, and my brothers have too. I think that's actually a key to our success. The fact that we have this cross-cultured approach, we've managed to understand cultures across West-East. It's an advantage to us." There is something that resonates with me long after the interview is over. Al Mana's even, forceful gaze as he sums up his goals for the future: "I will do anything that I feel will be beneficial to our Group, and at the same time help others." It comes across almost like a vow, and as he locks his eyes with me, I get the distinct impression that he isn't the type of man to make guarantees that he cannot keep, no matter the circumstances.